Find top performing preferred stock mutual funds 2014. Best funds are Forward Select Income fund, Destra Preferred and Income Securities, etc. Preferred stock is a security that has appearances as stocks and bonds. Income seeker like preferred stocks hence they pay high dividends. The yield is typically higher than common stock’s yield. You can invest through individual preferred stocks or investment funds. There are several investment funds offer preferred stock such as mutual fund, exchange traded fund, and closed end fund. With preferred stock mutual fund, you can buy and sell diversified selection of preferred stocks. Some of these funds are among the top mutual funds. Whether you are investing for your brokerage or retirement account, you need to find the right fund for your account. 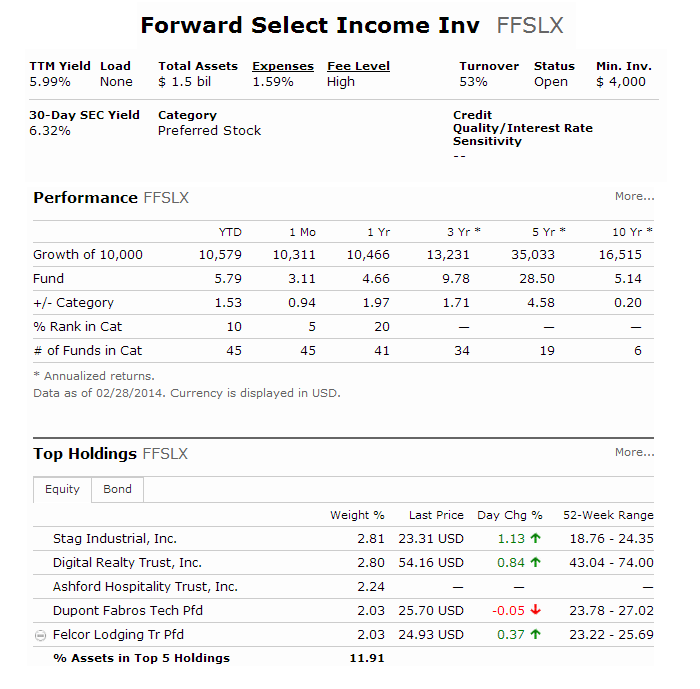 The main objective of the Forward Select Income Investor (FFSLX) Fund is to seek high current income and potential for modest long-term growth of capital. The fund’s CUSIP is 34987A178. This preferred stock fund was first introduced to public in October 2011. It has total net assets of $1.5 billion. The annual expense ratio is 1.59%. The quarterly-distributed dividend is 6.18%. This top preferred stock mutual fund is rated with 4-stars rating. Its benchmark is BofA Merrill Lynch Preferred Index. The YTD return of this fund is 5.15%. The other classes of this Forward fund are Institutional Class (KIFYX), Class A (KIFAX), Class C (KIFCX) and Advisor Class (FSIMX). The top holdings as of December 2013 are Digital Realty Trust Inc (3.18%), STAG Industrial Inc (3.15%), Ashford Hospitality Trust Inc (2.65%) and FelCor Lodging Trust Inc (2.39%). The Destra Preferred and Income Securities A (DPIAX) Fund distributes a high dividend yield of 5.53%. It has a sales load of 4.50%. The total net assets are only $33.5 million. It also has an expense ratio of 1.59% per year. This preferred stock fund seeks total return, with an emphasis on high current income. Peter G. Amendolair is the current fund manager. This high yield fund has returned 16.63% in 2012 and -0.35% in 2013. The current YTD return of the DPIAX fund is 4.42%. Since the fund is still new, it has no Morningstar rating yet. The top issuers as of January 2014 are HSBC PLC (4.75%), ING Groep NV (4.41%) and Citigroup (4.35%). 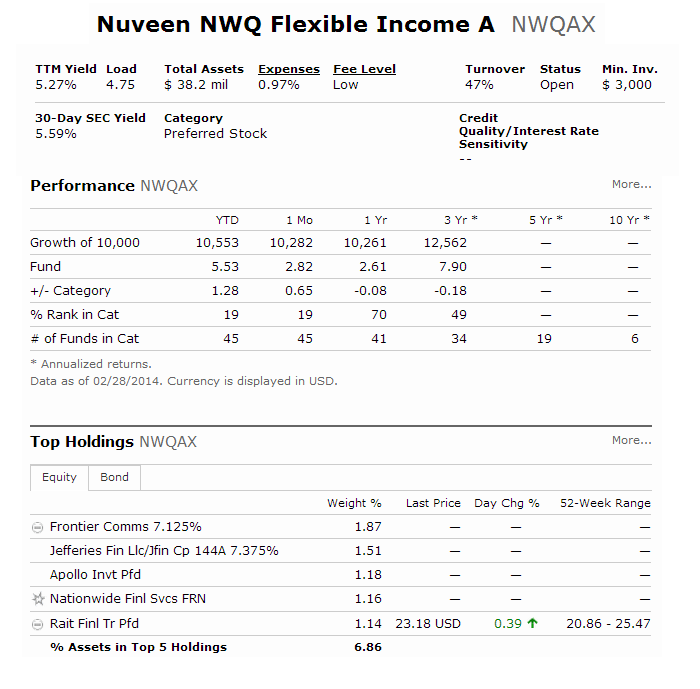 The Nuveen NWQ Flexible Income A (NWQAX) Fund was incepted in December 2009. It has annual expense ratio of 0.97%. The investors receive a dividend yield of 5.44%. The most recent distribution was $0.0910 in February 03, 2014. It is currently managed by Michael Carne since 2009. This best preferred stock fund has 1-year annualized return of 2.26% and 3-year annualized return of 7.66%. Morningstar analysts rated this fund with 1-star rating. It has annual holdings turnover of 47% as of February 23, 2014. The top portfolio allocation is Preferred Stock (49.70%) and the top sectors allocation is Financials (76.7%).